I have been meaning to write an article about anCnoc for quite a while, so Edinburgh Whisky Blog running the #anCnocAWeek competition has definitely acted as motivation to finally getting this written up. A good long while ago, I went to visit anCnoc, and got to taste some interesting drams. As someone who is passionate about whisky (and most distilled products) I hope when I visit where a whisky is made, that I will be able to get on with the people that make the product. It is a nice thought to think that you will genuinely like the folks that make your whisky, in the same way that Bart thinks he’ll like Krusty the Clown in the Simpsons. But here’s the thing, I really did like the folks at anCnoc when I visited (and none of them turned out to be angry, animated clowns). They were really nice guys, and they helped us feeble journalists and bloggers learn a bit about how to do their job. 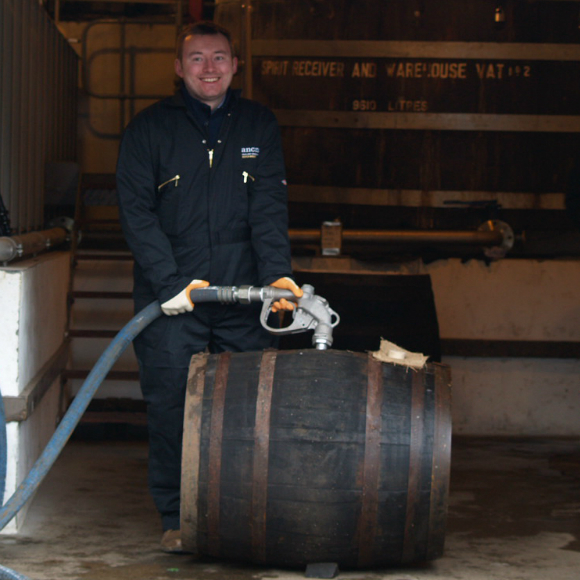 So after touring the distillery, we signed a cask each, filled it, rolled it down to the warehouse, and racked it. To talk to them, was to talk about the local community, the recent history (ups and downs) of the distillery and life working at the distillery. Like Old Pultney and Balblair, anCnoc was mainly used for blending in the past. So when they decided to release it as a single malt, there is an element of having a blank canvas. A fresh start. Which is why they have the creative space to create peated anCnoc, sherried anCnoc and I’m sure there will be future new products. They have the freedom to do it, and they have the backing with a company that slowly builds brands into a success. They also have the need to release new products, as their brand becomes increasingly saught after. It’s always nice trying the new spirit. I’m quite a fan, and it shows you the beginning of the whisky. This new make had beer malty notes on the nose, and biscuity, pear and a touch of sulphur. Rich, with chocolate and sweet black coffee notes, toffee, honey, vanilla and plum notes. Lovely raisin notes too. A blog represents the person writing the blog. Tiger’s blogs are analytical, point by point, blow by blow. Jason’s blogs are filled with monsters, unicorns and a dash of whisky. This blog shows my thought process. Quite scatter-brained, but moving in the right direction. So apologies for the fact this article jumps about a bit. But we got there in the end. This entry was posted	on Thursday, June 25th, 2015 at 1:08 pm	and is filed under Reviews. You can follow any responses to this entry through the RSS 2.0 feed. Responses are currently closed, but you can trackback from your own site.